It sounds as if a mass of pigs are approaching carrying with them the crackling sound of a thousand tiny fires spitting. Deep, growling through the earth the noise gets louder. The Yaptik family's eldest son Stasik sets aside his teacup. Getting up from his recumbent position he turns up the shrouds of thick fabric hanging in front of the chume’s entrance and disappears into the evening sunlight. ”They are here now," glints Valya Yaptik and we all go outside to witness the magnificent thunder of 2,000 reindeers running past kicking up spirals of dust silhouetted against the reddening sky. 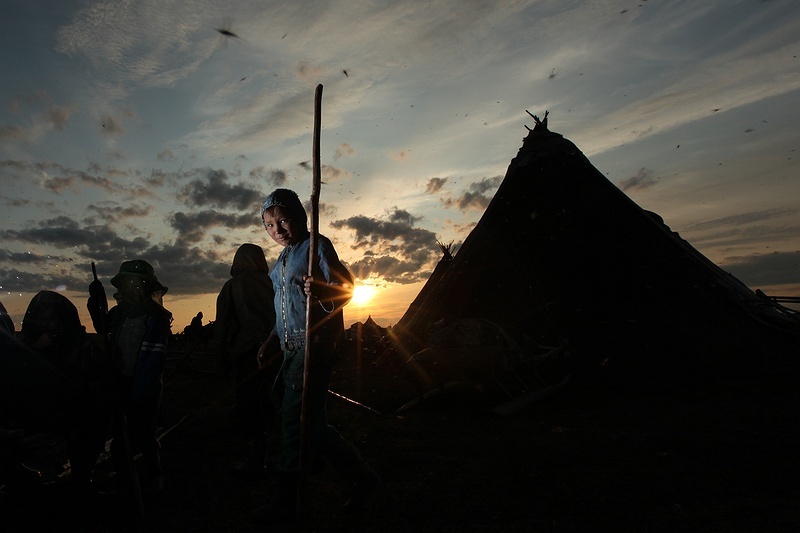 The Yaptik family is one of approximately 700 Nenet-families living nomadic on the tundra in Yamal in northern Siberia. The warmer climate in recent years is changing their landscape forcing them to move their reindeer herds to summer pasture a month earlier. ”When I was a kid, ice and snow were still there in June. Now it all disappears in May, or refreezes so the ground becomes solid preventing the deers from getting food. Autumn is considerably longer and the ice on the river comes much later and thaws earlier in spring affecting our migrating routes" says Valya while we watch the men lassoing and ear marking the small calfs. Valya Yaptik is mother of six and belongs to a nomadic tribe of Nenets who have retained their traditional way of life for over a thousand years. All year round she lives out on this expansive land in northern Siberia with her husband Yasha, six children, five dogs, a cat and the family's own two hundred reindeer. We wake up early the next morning by the crackling from the small fire in the middle of the chume. It feels like waking into a dream, a timeless existence living out on the tundra. Like their ancestors for thousand years the Nenets continue to live in chumes, sleep, dress and are fully dependent on reindeer, moving every 3 to 4 days to new pasture careful not to over use their resources. Valya doesn’t think their traditional way of life will survive for much longer. "Maybe forty years. Gas exploitation and increasing transport over the tundra destroys the pasture for the reindeer. There have been more in recent years, mostly gas industry vehicles and geologists. The landscape is also sensitive to climate changes. We will show you lakes that have completely collapsed within the past year”, she says. We set off on sledges pulled by reindeer with Valya's husband Yasha to an area where they used to settle, close to a once 600 square meter lake. “We used to fish here two years ago”, exclaims Yasha, clearly not losing the sense of shock. "The permafrost underneath subsided, creating a huge gulley at the edge of the lake," he adds. All that is left of the former lake is a piece of sandy desert , an unexpected phenomenon for the Arctic Circle. "We see more and more of these changes in our landscape and it scares me" says Yasha Yaptik before yelping at the reindeer to continue our tour of the changing terrain of the tundra.